The National Electrical Contractors Association ("NECA"), is the voice of the electrical construction industry. 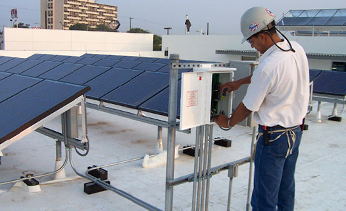 NECA has provided over a century of service to the $130 billion electrical construction industry that brings power, light, and communication technology to buildings and communities across the United States. Our national organization, and our 119 local chapters, advance the electrical construction industry through advocacy, education, research, and standards development. Our Mission is to represent, promote and enhance the management interests of its electrical members through labor relations, education, management skill improvement, apprentice and journeyman training, marketing, services, public relations, information, communication, and creation of a better business environment; and to coordinate the collective activities of the electrical contracting industry in the areas of government relations, technical standards, public relations, communication, information and business ethics.